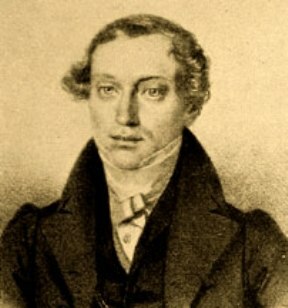 Joseph Böhm (Josef Bohm) was a Hungarian violinist and composer born (in Budapest) on March 4, 1795. He is best known for having been the Director of the Vienna Conservatory and the teacher of famous violinists; Joseph Joachim, Jeno Hubay, Jacob Grun, Heinrich Ernst, Eduard Remenyi, and Jacob Dont among them. He is also considered the founder of something called the Viennese School of violin playing, whatever that means. His first teacher was his father, concertmaster of the Pest Theatre Orchestra. Later, he studied with Pierre Rode. Bohm made his public debut in Vienna in 1816. He was 21 years old. He toured Europe as a soloist for several years. In 1819, he became the first violin professor at the Vienna Conservatory. Vienna was the musical capital of Europe at the time. In 1821, Bohm established a string quartet. He also became a member of the Court Orchestra - the Imperial band. He continued to tour but retired from concertizing in 1827. He retired from the Conservatory in 1848, but only because the Revolution caused it to close its doors. He was 53 years old. He continued to play in the Court Orchestra until 1868. He was 73 years old by then. He worked with Beethoven but how much time he spent in his company is unknown. Beethoven never dedicated any works to him. Bohm’s quartet sort of premiered Beethoven’s string quartet number 12 (opus 127, written in 1825), which turned out to be the first of Beethoven’s late quartets. The actual premiere took place on March 6, 1825, under the direction of violinist Ignaz Schuppanzigh. That performance was a flop and Beethoven was very displeased. Beethoven then asked Bohm to take charge of a second premiere which took place in late April, 1825. That second premiere was, by all accounts, an unqualified success. Beethoven was by this time completely and irrevocably deaf but he could tell how things went by watching the movement of the performers. Bohm played none other than the Prince Khevenhuller Stradivarius of 1733 (from 1820 until the day he died – 56 years he had it.) Upon his death, the violin went to his nephew (Louis Bohm) and eventually (in 1930) ended up in the hands of another famous violinist – Yehudi Menuhin. Bohm died (in Vienna) on March 28, 1876, at age 81. Beethoven had been dead 49 years.